Ex-Soviet Kyrgyzstan kicked off the so-called World Nomad Games it has hosted biennally since 2014 Monday with Turkey pledging to host the 2020 edition of the week-long traditional sport extravaganza. The picturesque Kyrchyn gorge near the shores of the Central Asian country's Lake Issyk-Kul was awash with colour as dancers and horse riders entertained international and local guests before the real action begins Tuesday. Kyrgyzstan has promoted the games as a way of preserving traditional sports, most of which were played by Turkic nomadic peoples over the centuries, while boosting the impoverished republic's fledgling tourism sector. The games feature more than 40 sports contested by hundreds of athletes from dozens of countries with Kyrgyzstan's Central Asian neighbours and Russia tending to send the largest teams. The news Kyrgyzstan is handing the games over to Turkey for 2020 has saddened some in the Central Asian state, but relieved others given the tens of millions of dollars poured into the games in the last four years. Talgat Soodakov, a sportsman who will compete later this week in a polo-like game played on horses with a goat carcass for a ball told AFP that he could not be certain he would be able to compete at the games in Turkey. "Still, it will be interesting to see how another country organises the games," Soodakov told AFP. 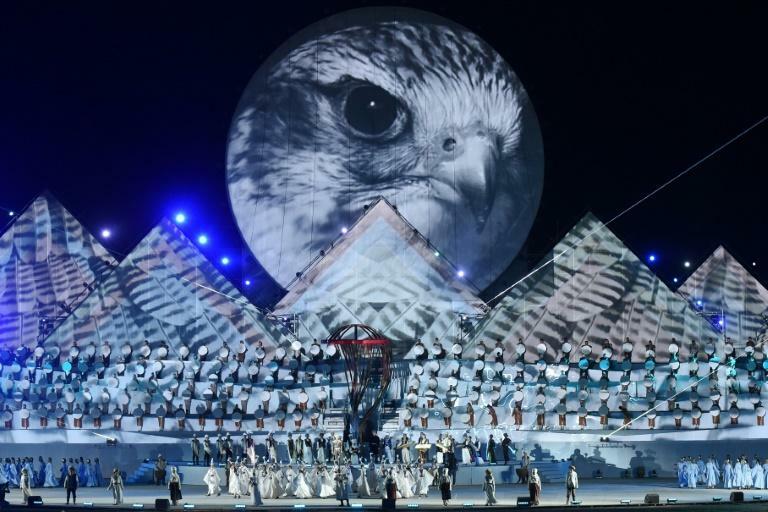 Monday saw spectacles showcasing Kyrgyz culture put on for spectators after a Sunday night opening ceremony attended by Turkish President Recep Tayyip Erdogan, Hungarian Prime Minister Viktor Orban and Kazakh leader Nursultan Nazarbayev among others. An AFP correspondent in Kyrchyn on Monday estimated that there were at least 1,000 foreign tourists in a crowd of up to 10,000 in Kyrchyn. One traditional Turkic game that earned loud applause and whoops from spectators saw a female rider gallop past a male competitor and playfully whip him as he strained to overtake her. The objective of the male rider in the game called Kyz Kuu is to steal a kiss from the woman rider as he overtakes her, but only a few managed it during the show Monday. Kim Bo-Kyum, a 55-year-old professor from South Korea told AFP he had come to Kyrgyzstan specifically to watch the games and was taken aback by the pine-covered mountains of the Issyk-Kul region. "I hadn't the slightest clue what (the games) would be like but I was interested in finding out more about the nomads of the region," he told AFP. In addition to the goat polo game known as Kok-Boru and other horse games, the World Nomad Games have showcased different types of wrestling and "intellectual games" including one played with a sheep's anklebones. Turkey's decision to host the 2020 games was confirmed in a statement released on Kyrgyzstan's presidential press service following talks Saturday between Erdogan and his Kyrgyz counterpart Sooronbai Jeenbekov.